Carriers and routes change all the time - Monarch, Darwin, Bmibaby, SnowJet, Go, Buzz, Duo, EUJet, BA Connect, MyTravelLite, ThomsonFly, British European, Excel (XL) and FlyGlobespan have all now disappeared. Note that many routes only operate in peak Winter season too. You're all old enough to realise that schedules change frequently. This is just a guide to assist you and focuses on flights during the main part of the Winter season - many routes don't run in Summer at all and some don't get going fully until January with additional flights at peak holiday times. Usually you're going to fly in to either Geneva, Lyon, Chambéry or Grenoble airports. Turin Airport at 3.5 hours drive and through the expensive Fréjus tunnel is not really an option. Annecy Airport no longer has scheduled flights to Paris and St. Etienne Airport is no longer used by Ryan Air for flights from the UK. Air France have some innovative air/rail combined tickets via Paris to Lyon Railway Station where you could continue on to Moûtiers for your final transfer. Helicopter Transfers to Courchevel Altiport or Méribel Altiport are available if you're seriously loaded and hate traffic! Prices start from around €2,200 one-way from Geneva for 6 passengers. For further details of all the airports, their locations, travel times and transfer information including driving directions, car hire, private transfers, bus & rail links etc check out the La Tania Transfer Page. 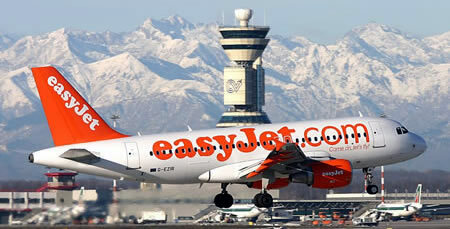 easyJet are still leading the way with up to 76 flights per day from 15 airports across the UK to Geneva, Lyon & Grenoble for Winter 2019. Geneva for Winter 2019 from Aberdeen (Sat), Belfast (Wed/Thu/Sat/Sun), Bournemouth (Mon/Thu/Fri/Sat/Sun), Birmingham (DAILY), Bristol (DAILY), Edinburgh (DAILY), Glasgow (Sat/Sun), Liverpool (DAILY), Manchester (DAILY), Newcastle (Mon/Thu/Fri/Sat/Sun), Gatwick (DAILY), Luton (DAILY), Stansted (DAILY) Southampton (Tue/Thu/Sun) and Southend (Mon/Thu/Fri/Sat/Sun). No Leeds/Bradford flights any longer for Winter 2019. Also to Geneva from all over Europe including Alicante, Amsterdam, Barcelona, Berlin, Budapest, Crete, Dubrovnik, Figari, Hamburg, Ibiza, Madrid, Mykonos, Nantes, Nice, Malaga, Lisbon, Olbia, Palermo, Paris, Palma, Prague, Pristina, Sharm El Sheikh, Copenhagen, Santorini, Stockholme, Tel Aviv, Toulouse and Rome (some of these seasonal). Lyon for Winter 2019 from Belfast (Sat), Bristol (Sat), Edinburgh (Sat), Manchester (Sat), London Gatwick (DAILY), Luton (Mon/Wed/Fri/Sat/Sun - DAILY mid-Feb & March, not Sat in April!). No Southend flights any longer but Stansted is new (Sun plus Thu at peak times) for Winter 2019. Also to Lyon from a whole host of European destinations including Agadir, Ajaccio, Barcelona, Bastia, Berlin, Biarritz, Bordeaux, Brest, Casablanca, Dubrovnik, Figari, Ibiza, Krakow, Lisbon, Madrid, Majorca, Marrakech, Nantes, Olbia, Palermo, Porto, Rome, Split, Toulouse and Venice (some of these seasonal). Grenoble for Winter 2019 from Bristol (Sat/Sun), Edinburgh (Sat), Liverpool (Sat), Gatwick (Fri/Sat/Sun plus Mon at peak times)), Luton (Sat/Sun) and Stansted (Sat/Sun). No Birmingham flights any longer but new Sunday flights from Bristol, Luton & Stansted and Gatwick has added some Friday and Monday flights. On 12 Nov 2009 easyJet announced the original IATA sized hand baggage (56x45x25cm) up from 55x40x20cm and on-line check-in for those with hold baggage too. Note than in June 2015 IATA announced a new recommended cabin baggage standard of 55x35x20cm but this is still to be implemented across the industry. In Summer 2013 they introduced optional advance seat reservations and speedy boarding to include a speedy check-in / bag drop off desk too. Winter 2014 saw the introduction of a smaller hand baggage size of 50x40x20cm which is guaranteed to be taken in the cabin as you may get your standard size taken off you and placed in to the hold if the flight is busy but at no additional charge. Note however, that there is no weight limit on hand baggage as long as you can put it in the overhead locker yourself! Spring 2015 saw the inclusion of Fastrack Security charge with the easyJet Plus membership (along with a membership price increase). Now available at most airports including Geneva and Lyon. An additional bag of 45x36x20cm is also allowed for easyJet Plus cardholders. Standard hold luggage limit remained at 20kg until Autumn 2017 - see below. Autumn 2017 saw hold baggage options of 15kg or 23kg introduced. Note that non-direct routes with changes via Southampton, Paris etc are often quoted on their website and code shares exist with Air France (although usually much cheaper to book on the Flybe site). Additional Regional Airports include Norwich, Newcastle, Newquay, Doncaster, Inverness and Guernsey. Flybe may use Bombardier Q400 (78-seat, twin-turboprops) and Embraer 195 planes (118-seat, twin-jet engine) so read the small print - they are sometimes limited in the number of sets of skis they can carry too so always pre-book sports equipment. Standard cabin baggage size is 55x40x23cm / 10kg and hold luggage 20kg. Jet2.com offer great-value flights & package holidays to exciting sun, snow and city destinations from nine UK bases: Leeds Bradford, Manchester, East Midlands, Newcastle, Birmingham, Edinburgh, Glasgow and London Stansted. Make the most of the low £60pp deposit, convenient flight times, 2 to 5* accommodation, and zero credit card fees. Standard cabin baggage size is 56x45x25cm / 10kg and hold luggage 22kg. Summer 2016 saw Jet2 restrict alcohol sales - From 8 Aug 2016 no alcohol will be sold on board before 08:00. Grenoble from Stansted (Sat/Tue) from £12 one-way! Get in early and they still do have some real bargains but of course beware all the extras. Hand baggage has a 10kg limit last time we checked and they do get stroppy about exact cabin bag size, which is a smaller 55x40x20cm size than many airlines. Since 2015 they have got a little better and allow a small handbag too of 35x20x20cm plus reserved seats etc. Hold baggage is charged at 15kg or 20kg amounts. Playing the game by their rules, we did manage a GBL - EMA on the No Taxes promotion. €3.75 ALL IN (hand baggage only, on-line check-in, Ryanair Cash Passport etc) on a Saturday in 2009. Understand the rules, accept what you're getting and some great prices are available. Turin from Stansted could be an option if you're desperate - it's a 4 hour drive via the Fréjus tunnel (about another €30 each way if we remember rightly). Unless you pay at least £6 for priority boarding, you'll only be able to take one handbag-sized bag (to fit under the seat in front of you) into the cabin on flights from 1st November 2018. Use ski bags fully and get some clothes in there too. Get boots in main case and always pre-book bags and skis on-line (or hire when you get there - latest skis, fully maintained and no hassles...). Etihad Regional Swiss regional carrier Darwin Airline (who took over Baboo after their ill-fated Oxford- Geneva service) have now become Etihad Regional and used Cambridge Airport as its base in the UK. this has now been dropped. They have several options from Spain and Italy in to Geneva. Winter 2016 saw Inghams Charters flying Saturdays from Cambridge to Chambéry but this has also been dropped. Wizz Air is Central and Eastern Europe’s largest low-cost airline which started flying in May 2004. They now have seasonal flights to Grenoble, Lyon and Geneva. To Grenoble from Warsaw, Gdansk and Vilnius. To Geneva from Sofia and Bucharest. Transavia.com LCC set up by Air France and KLM. August 2012 saw the announcement of the return of the Paris – Chambéry route after an absence of 11 years but it looks like this route has been dropped despite The 3 Valleys and Chambéry Airport helping to finance and promote it. Chambéry is under 3 hours from Paris on the fastest TGV trains. To Chambéry from Rotterdam/The Hague & Amsterdam (both Sat) from €49 one-way. To Grenoble from Rotterdam/The Hague (Sat) from €39. To Geneva from Rotterdam/The Hague (Sat) from €39. Also to Lyon during the Summer from tourist destinations across Greece, Spain etc. In 2018 Transavia started flying to Paris Orly from Edinburgh. Should be included here as Hop! are another LCC now incorporated under the Air France banner with flights from all across France to Lyon plus some from Bologne, Brussels, Dusseldorf, Milan, Nuremberg, Prague, Rome and Venice. They also fly to Geneva from Biarritz and and Calvi in Corsica but still no flights from the UK for Winter 2019. Blue Air are another LCC we should mention - nthis one from Romania and flyinh over 5 million passengers in 2017. They fly in to Lyon from destinations in Romania plus Bucharest, Catania, Larnaca, Stockholm and Tel Aviv. No UK to Lyon options for Winter 2019 though. Thomson Flights which merged with First Choice Flights now really focus on charter flights. They had scheduled ThomsonFly services to Grenoble from Bournemouth and to Geneva from Doncaster and Coventry but basically they only fly to the Med, Canaries and Red Sea now. There are lots of Thomson packaged charters under the TUI banner (mainly Crystal Ski) going in to Chambéry and flight only fares are sometimes made available - see below. Hapag-Lloyd Express - fly to Geneva from Cologne/Bonn. They fly to Cologne/Bonn from Manchester or possibilities exist to use in conjunction with GermanWings from Gatwick, Stansted and Edinburgh or Air Berlin from other parts of Europe. With all of the budget airlines you've got to get in quick to get the cheap fares! Occasionally there are sales and remember easyJet will refund any difference if their fare does come down in price nearer to the departure date. British Airways the national carrier, still with a free bar but the snacks are hardly worthwhile. Ski carriage, baggage charges & seat reservation charges are all being phased in too. Lead-in prices often hand baggage only now. Geneva for Winter 2019 from Heathrow (up to 11 x daily), Gatwick (up to 6 x daily) and London City Airport (up to 4 x daily) with Winter 2019 prices starting from £29 one-way including taxes. Can often be cheaper that the no frills lot when booking at short notice or for flights on Saturdays a year in advance. Charges are now being made for seat reservations, credit cards, hold baggage plus skis & snowboards. Standard cabin baggage size is 56x45x25cm plus personal bag 45x36x20cm & hold luggage 23kg (short haul). SWISS International have prices for Gatwick to Geneva starting from £42 one-way. Geneva from London Heathrow (daily up to 5 a day). Geneva from London City (daily up to 3 a day). Always worth checking out their prices plus skis, poles & boots (or snowboard & boots) still always go free but lead in prices are hand baggage only! Standard cabin baggage is 55x40x23 / 8kg and hold luggage 23kg. Air France UK still operating old school style with free drinks, food and hold baggage (and certain single fares more expensive than returns - remember Apex rules? ), code share options with Flybe available now (usually cheaper on Flybe site). Direct services to Lyon from Heathrow and Gatwick now dropped. The Lyon from Birmingham Flybe codeshare does not seem to be bookable via Air France anymore and it looks like direct flights from the UK to Lyon have ceased. Plenty of option via Paris or their KLM partners via Amsterdam. Decent fares also available via Paris (or using KLM via Amsterdam) from many regional UK airports. Can sometimes use a combined rail/air ticket using the fast Paris/Lyon rail connection. Generally Air France domestic flights purchased in advance are a good deal (Paris - Lyon from £33 each way even on Saturdays for example). However not so competitive internationally - can be worth a cheap easyJet to Paris and then onwards via Air France for a good deal. Standard cabin baggage is 55x35x25 / 12kg and hold luggage 23kg. Lufthansa - to Geneva via Berlin, Munich or Frankfurt from Birmingham and London. Flexible fares can be good value. All these middle-east airlines are now flying from all around Australia & Auckland to Geneva via Abu Dhabi, Dubai or Doha and are very useful for all our Aussie & Kiwi friends who now don't have to make that extra European connecting flight. Alpine Airlines announced the restart of commercial "on demand" flights from Courchevel altiport on 22 June 2015. Tariffs are not released publicly but their plane is 30% quicker than a helicopter, takes 5 passengers and with more luggage space too. Routes from Courchevel include transfer options from Geneva, Lyon, Grenoble, Chambéry, Annecy & Valence or direct services from Paris, Nice/Cannes/St Tropez, Marseilles, London & Turin. Thomson Holidays / TUI - offer package ski holidays (brands include Crystal & Flexiski) with charter flights from local airports to all the main ski resort destinations. Lots of flights now go in to Chambéry, the nearest airport to La Tania - they even pay Lyon airport a retainer so ground crew & baggage handlers are on standby ready for any closure of Chambéry airport in bad weather. Crystal have their last minute Super Deals and are often hard to beat. Inghams introduced a new package only route from Cambridge Airport to Chambéry for Winter 2016 with Eastern Airways but this looks likely to have been dropped for 2017. From Geneva or Lyon direct to the Altiport at Courchevel 1850 or Méribel. Possible from SAF on +33 479 080091 or WhiteTracks but is always dependent on weather conditions. Monarch ceased trading on 2 October 2017 with all associated companies (running their holidays and engineering division) going into administration and the loss of 2,500 jobs. They had trouble in 2016 and were only given their CAA licence after an emergency week extension and more capital injection - this time however, they went under with some 110,000 customer already abroad and an estimated 400,000 future bookings affected. BMI Regional - left over from the sale of BMI to BA, they operated fairly competitive flights from Manchester and Birmingham to Lyon in 2014. These routes have now been discontinued. Darwin Airline (who took over Baboo) from December 2013 are now Jihad Regional and operated flights from Cambridge to Geneva for Winter 2014. BMI were bought by British Airways and their routes merged in to BA / IAG Group from 28 October 2012. Bmibaby - Ceased to exist from 9 September 2012. In Winter 2012 Bmibaby flew to Geneva on Sat/Sun (Fri/Sat/Sun/Mon in Feb & March) from East Midlands, also to Geneva on Sat/Sun from Birmingham and Belfast City plus To Chambéry on Sat/Sun from East Midlands. Jet2 have stepped in at East Midlands, see above. Now a charter only operation on behalf of tour ops including Club Med, Crystal Ski, Esprit Holidays, First Choice Ski, Inghams, Skiworld, Ski Total and Thomson Ski. Had useful Chambéry flights in 2012. Baboo flew from London City to Geneva in 2010 but now withdrawn. They also tried to get a route up and running from Oxford Airport (just off the A34 to the North of Oxford) to Geneva but it didn't last long. They were taken over by Darwin Airline who are starting up a Cambridge - Geneva service for Winter 2014 (and then subsequently taken over as Jihad Regional - see above). previous daily service. Bmibaby closed on 9 September 2012 following BA owners taking over BMI. Flybe has grown out of British European. FlyGlobespan Scotland's low cost airline flew to Geneva from Edinburgh but went in to Administration on 17 December 2009. MyTravelLite (now FlyThomasCook) flew from Birmingham International to Geneva with some very cheap mid-week deals in 2002/3 but didn't run the following year. Matair used to fly (very small planes!) direct from Southend to Courchevel 1850 Altiport until around 2000/2001 season - it wasn't too mad a price if you filled the plane too. Their London taxi transfer vehicle was parked in 1850 for many seasons following this but the service quietly disappeared. Of course easyJet fly from Southend to Geneva now! Excel Airways were re branded XL.com and used to fly to Geneva from Gatwick & Manchester on Sundays - they went bust on 11 September 2008. Go who were bought by easyJet and kept their Stansted to Lyon route. Buzz were bought by Ryan Air but didn't keep the routes to Grenoble, Lyon and Chambéry although Grenoble was eventually brought back from Stansted after St. Etienne was dropped on 6th June 2006. EUjet flew to Geneva from Kent and Shannon during Winter 2005, they went bust on 26th July 2005. Virgin Express flew to Geneva from Brussels which was their European hub but this disappeared in 2009. Thomson Flights had scheduled ThomsonFly services to Grenoble from Bournemouth and to Geneva from Doncaster but these appear to have been dropped and sadly all ThomsonFly flights from the excellent tiny Coventry airport ended on 2nd November 2008. Now a charter operation but flight only fares may be available.